6. A Torque Wrench set to 80 nm which is very tight. TIP: I spray painted the Bolt Heads, Spacers and Washers in Satin black the night before I fitted them. They look really good on the Tiger. My shins did catch them at times but overall I was delighted with the crash bars. 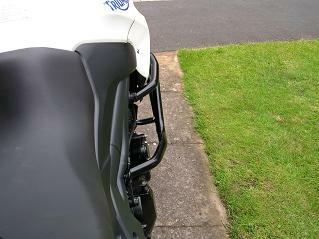 bars do not protect as well as the Thunderbike Bars on my old Tiger 955i.